Home » Post tagged "Maria Mccloy"
This is the most important event of the year. 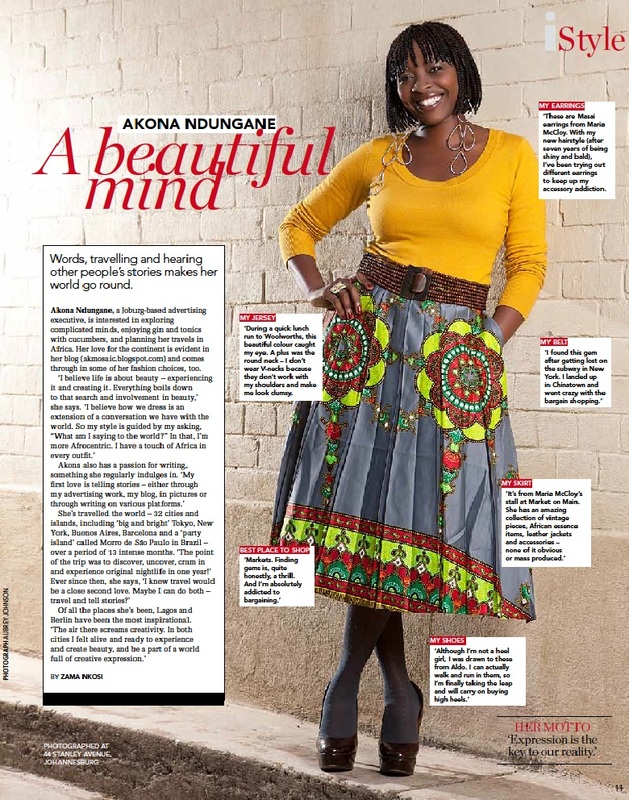 On 6 December 2013, for the first time, TEDxJohannesburg celebrates women and the powerful role they play in inventing the world we live in, by hosting TEDxJohannesburgWomen. This event is held in partnership with the Gordon Institute of Business Science (GIBS) at their Illovo campus, in Johannesburg. Alright, let’s start from the beginning. First off, I was honoured with an amazing email from the organisors inviting me to the event tomorrow, and I completely forgot. I think them calling me prolific could have had something to do with it. I am attending this full day of inspiration, presented by prolific women and their journey’s, and I have ONE ticket available to share with someone. TEDx talks around the world are important, vital and incredible events of sharing and learning and essentially having your mind blown by humans who can’t help but be great. Confirmed speakers include breast cancer activist Kwanele Asante-Shongwe; laughter and happiness professor Shareen Richter; game design lecturer Hanli Geyser; mother of child burn-victim Pippie Kruger, Anice Barnard Kruger; computer science PhD candidate Mpho Raborife; executive coach Desray Clark; engineer Hema Vallabh; educator Marli Hoffman; social transformation guru Barbara Holtmann; sociologist Grace Khunou; music writer Diane Coetzer; and social justice activist Gillian Schutte. I’m impressed that someone realised how important it is to have a women focussed session – I really never expected it. Women move the world and we don’t celebrate this enough. Join me tomorrow by telling me the best piece of advice you’ve received from a woman. It may have been something a woman told you, something you read in a book by a woman, a song that changed you by a woman. What is that one thing that moved you? I’m so in love with my mom’s old skirt. It’s such a great fabric! So a few months ago I got an unexpected message from City Press Lifestyle writer Zama Nkosi to ask if I’d be interested in taking part in the City Press iMag, iStyle, feature. Of course I was completely flattered and it took a moment to wonder if she was maybe asking the rugby playing Akona Ndungane and mistakenly sent me the message:) Turns out not to have been the case and I finally agreed. She then sent me a layout of a previos iStyle feature they’d done with some gorgeous shoe designer whose name I have since misplaced in my head. Her profile was so beautiful and interesting, glossy and delicious. I could not believe she thought me worthy of such. The shoot happened on a sunny afternoon at 44 Stanley. I was extremely nervous! The brief was to bring an outfit and accessories that I loved and had a story to tell about myself. Not as easy as it would seem. At the time I was (and still am) going through a bit of a body confused stage. The stylist, Zama and Photographer were all really encouraging and friendly, which made the nervousness a little less paralysing. This was the final product. Some of my favourite items at that time. 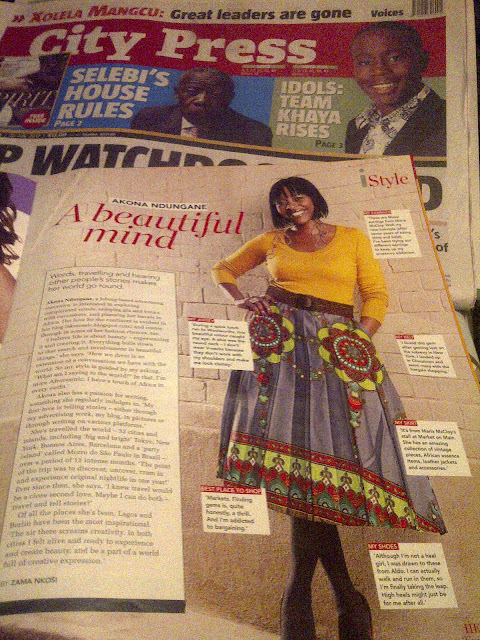 Featured in 22 July issue of City Press magazine. Princess for a day. Hopefully if you click on the image you can read the good bits. Thank you to Maria McCloy for always having such beautiful goodies – the skirt and the earrings are from her Market on Main stall. Thank you Zama Nkosi for giving me the opportunity to be a princess for a day, and making my blabbering sound good from the interview. Please pass along my thanks to your team. Maria McCloy – the vintage queen, African Print clutch bag maker, Accessory creator extraordinaire! Long wire earrings. I think they are from her Masai inspired range. Loving these lately because they work so well with my coverall hairstyle. 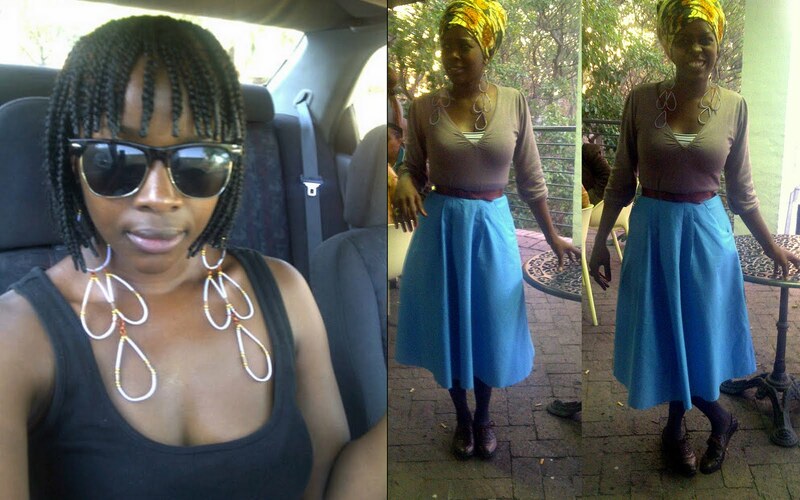 The blue skirt from her R50 vintage box from a while ago – had to get it tailored to fit my newly slimmed waistline. I love the colour and the fact that it has pockets. Pockets are a girls best friend! Again – do check her out every Sunday at the Market on Main at Arts on Main between 10am and 3pm. You will not be sorry.